Last year we came in 2nd, this year let’s show them who’s #1! 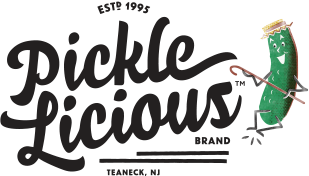 – The Pickle Licious Family! Regular – full sour, half sour, Kosher dill, sour tomatoes in center with marinated mushrooms, sweet red pepper filets and pitted Kalamata olive garnish. Full sour, half sour, Kosher dill, new, sweet, sweet, chili, hot and spicy, hot and spicy half sour, horseradish. What Is Our Best Selling Pickle? “Fresh” is the word with our Half Sour Pickles! These are lightly brined to give you the ultimate fresh cucumber bite with a clean delicious flavor. These are the greenest pickles that we have. They are listed as ½ sour because they won’t be as green as our NEW pickles are at a Farmers Market, once they are shipped. They will turn ½ sour after only 1 or 2 days. When you receive them you may see a cloudy brine, this is perfectly normal. They are in the process of “turning”. Mild and super-refreshing! Many people love the crunchy texture and the taste of the lighter brine. Continue Reading | Comments Off on What Is Our Best Selling Pickle? Q: What happens when you get some vinegar in your ear? A: You suffer from pickled hearing! Q: What is the pickle’s philosophy of life? A: Never a dill moment. Q: What’s green and sour and swims in an aquarium? A: A trop-pickle fish! See the complete list of where you can find our van this weekend. Our Half Sour Pickles are on sale this week when you order them online. If you are on our email list, we have already emailed you the code. If you are not on our email list, and you want to get coupons and discounts than all you have to do is to sign up and it is free and easy. We don’t sell your information or fill your email with spam. Half Sours are Shipping Again! Half Sours are Shipping Again ! Thank you to all of our patient customers…. Fresh” is the word with our Half Sour Pickles! These are lightly brined to give you the ultimate fresh cucumber bite with a clean delicious flavor. Continue Reading | Comments Off on Half Sours are Shipping Again! You can still buy our Half Sour Pickles in person at the following Markets. See the list of Farmer’s Markets that Pickle Licious will be attending.